This Special Collections exhibit, “Are We There Yet? Travel, Tourism, & Exploration,” recently mounted, consists of six cases of materials drawn from their collections and arranged thematically. The beginning of the exhibit with its “Around the World” theme includes three shelves of material in a tall, vertical case. On the top shelf are three books, each with “Around the World” as part of its title; publication dates range from 1886 to 1912. On the next shelf are guide books and travel narratives and a curator’s placard explains, “Travel narratives are more descriptive of the lands and people the author experiences, while guidebooks advise travelers on where to stay and what sights to see.” The lowest shelf houses assorted books relating to “Modes of Travel.” Be sure to examine the illustration of a 1906 Autocar Runabout Type X and the “Photograph Album Documenting a Road Trip Across America in 1924” with its collection of photographic post cards and amateur photographs. “The World’s Fair” case displays materials from the fairs of 1876 – International Exhibition, Philadelphia; 1893 – World’s Columbian Exposition (commemorating the four hundredth anniversary of Columbus’ arrival in the New World), St. Louis; 1915 – Panama-Pacific International Exposition (celebrating the completion of the Panama Canal); and 1933 – Chicago World’s Fair: A Century of Progress International Exposition. “World’s fairs function as a way to bring culture, history, and technology together in one event to people of many backgrounds,” explains the curator’s placard. 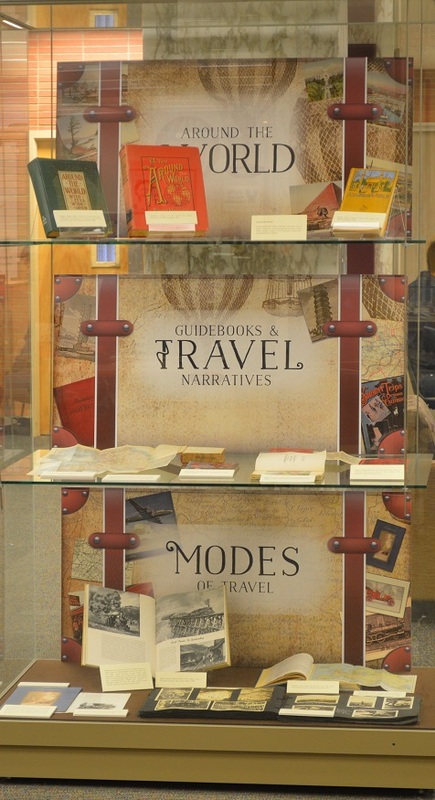 “Religious Travel” is the focus of the next case, displaying six books, four of which are open to show illustrations. These books were published from 1851 to 1905. One, “Guide to the Holy Places…,” was written by a Franciscan, Brother Liévin de Hamme and owned by Charles M. Driscoll, OSA, whose handwritten notes are visible on the page opposite the title. A curator’s note explains the “Visiting scared sites presented a powerful motivation for some travelers” in a time before vacation travel became popular. There are books here about “Lands of the Moslem…,” “Cairo to Constantinople …,” Mecca, Egypt and Palestine and the Holy Land. In the “North America” case are two photograph albums, a 1926 “West Coast of North America Scrapbook,” and “Traveling theater companies and vaudeville acts in America, 1910-1921.” Books in the case deal with the Adirondacks (1917), Mexico (1886) and Old New York (1899). The final section of this exhibit is “Imaginary Travel;” here are books about trips to the Levant, Naples and other areas, including Mark Twain’s “A Tramp Abroad,” published in 1880. There are four paperbacks, displayed so that we can see the maps on the backs of three and a tropical scene on the fourth. These stories were published between 1934 and 1957. The exhibit was curated by Laura Bang, Digital and Special Collections curatorial assistant, and Kayla Van Osten, a Digital Library intern in spring 2016. Bang and Michael Foight, Special Collections and Digital Library coordinator, installed the exhibit. Joanne Quinn designed the exhibition poster and other graphics. The exhibit will close on December 20. The online version of the exhibit is now available; it includes much more material and information.